Cyrus Baldridge: An American Artist in China presents a selection of works from the Art Museum’s permanent collection that were completed during the artist’s journeys in Asia where he captured the people and the landscape. 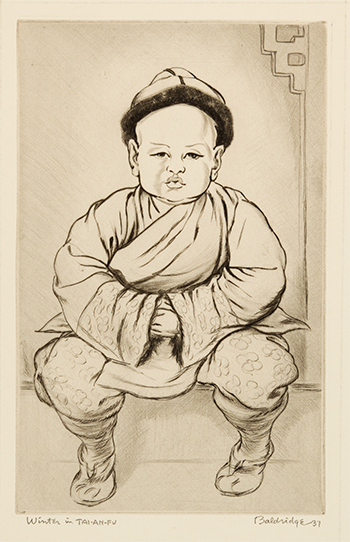 While traveling through Asia in the 1920s, Baldridge’s exposure to the sparse lines of traditional Asian art dramatically affected his style. 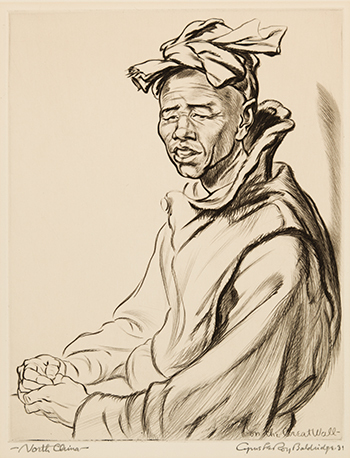 He learned traditional techniques from Japanese and Chinese masters and produced numerous etchings, drypoint, and woodblock prints. This transition away from traditional illustration brought Baldridge acclaim and recognition as an artist. This success led to several important commissions, and by the early 1940s he had illustrated more than one hundred books and magazine articles, and had a successful career in the American Southwest as a painter. Works from this pivotal point in Baldridge’s career are included in this exhibition. Through these artworks, the transition from illustrator to his use of free, sparse lines is evident; and it provides the rare opportunity to see the work of an artist in transition. Cyrus Baldridge: An American Artist in China premiers this new exhibition available through the Art Museum’s Regional Touring Exhibition Service. It is available for travel across the state in the fall.